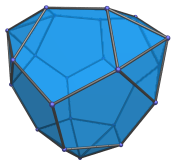 The triaugmented dodecahedron (J61) is the 61st among the Johnson solids. 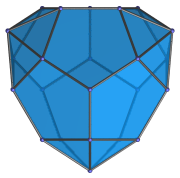 It has 23 vertices, 45 edges, and 24 faces (9 pentagons and 15 triangles). 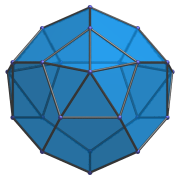 It is constructed by augmenting a dodecahedron with 3 pentagonal pyramids on non-adjacent pentagonal faces. 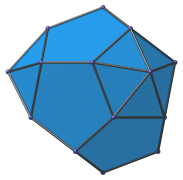 If one of the pentagonal pyramids is removed, the result is the metabiaugmented dodecahedron (J60). If two pentagonal pyramids are removed, the result is the augmented dodecahedron (J58). Side view, parallel to pair of opposite pentagons. Parallel to pentagon opposite an augment.